by Oliver Kilbourn. Saturday Night at the Club. I interviewed the Playwright Lee Hall about the uneasy relationship between the working class and art, how we can still produce art outside of commerce and fiscal motives, and if we are prepared to respond to the political and cultural assault from the Coalition government. Jonny Gordon-Farleigh: Your plays don’t only feature the mob that can read but also the mob that can paint (The Pitmen Painters), and the mob that can dance (Billy Elliot). You show the lives of working people precisely when they are not working, unlike most productions that like to glamourise the work. Is this a conscious part of your work? Lee Hall: Yes, very much so. Growing up in a working class environment I think that there was so much about the culture that I didn’t understand was creative and artistic. So much of the received wisdom said that there were certain areas which were art, artistic, and I suddenly realised that a lot of what I did, my granddad and my dad did, were creative acts and I suppose it is sort of contentious and political for working class people to own that space. I was very interested in that as both a metaphor and as a praxis. It’s also quite autobiographical and so it was very conscious because it was made conscious for me. Where I came from in the North East, a working class town, I was always very self-conscious about doing anything artistic at all, because it was actually considered very problematic. And those who weren’t interested at all were incredibly suspicious of why I was engaged in this. So it was never neutral for me. And then understanding these things about working class history, as part of my learning, and realising it was quite important to me to celebrate and re-own that effort and history. Until recently this had pretty much dropped off of the agenda: to celebrate the fact that the working class people do have a very long tradition of being culturally and intellectually engaged. The intellectual side of the working class is something very important to me. JGF: These ideas about intellectualism and the worker also feature in the French philosopher Jacques Ranciere’s book Nights of Labour. In his research about the lives of workers in 19th century France he found that rather than submitting to their identities as simple workers they would instead put off sleep as much as possible in order to create newspapers, poetry, plays and literature. Ranciere called them intellectual-workers and saw their creativity as a subversion of the division between the hand and the head. This seems to also feature prominently in your own work. LH: Yes, I came to the realisation that play is work, and creation is work and in the Pitmen Painters I look at how art is labour. That realisation opened a lot of doors to me and broke down that division. JGF: Are you interested in working class autodidactism outside of the academy? LH: I am interested in how art depends on being a collective enterprise, the fact that there was a genuine culture and that autodidactism generally doesn’t take place in isolation. I am very interested in how that culture then meets institutions like the university and higher education. This was the tension and fun in my play The Pitmen Painters — where autodidactism and the university pressed together. JGF: As in the case of the Media, who funds art has always been a very pertinent question and you deal with this issue personally in the Pitmen Painters. With all the problems of art funding, have you experienced any interesting models where art can avoid these pressures? LH: One of the most important things for me in terms of art, and something I learned quite early on, was through meeting musicians playing Irish music and learning Irish music and jigs when I was about eight or nine years old. And then getting into the folk scene, which was linked up to all sorts of communities in Britain and Ireland. What really impressed me was that some of the greatest musicians were workers — one of the flute players was a bus conductor; the person who taught me fiddle was a lecturer in history. There were also people who ran small hotels. It was a chance to be in a culture where art was made outside of commerce. I have always been drawn to and always been interested in people like the Pitmen Painters who refused to valour work and to take part in the commodification and fetishisation of the things they make. JGF: One of the characters in The Pitmen Painters is persistently troubled by the offer of patronage. LH: Yes, the whole idea of patronage is a big issue and I obviously make my living from art. I think so much of the art that I really hold dear, so much of the poetry, always takes place outside of market forces. The majority of poetry and literature is only considered in commercial terms and this seems to be all anyone wants to talk about in the mainstream media. I am really troubled by that and I’m trying to promote that there is nothing second rate about art that is made outside of those circumstances. I think, in a sense, art is a matter of participation and the other thing that was very important to me growing up in Newcastle was the very strong youth theatre movement. The whole point of that and its explicit aim, which was funded by the local charity, was to educate kids. It was based in a very depressed working class community, but we used to go and learn about Bertolt Brecht and also make up our own plays. I remember we even toured one play around during the miners’ strike. Participating and encouraging participation in art seems a very important thing to do, in terms of challenging this bourgeois notion that art is only commercial, concerned with fiscal motives or that you necessarily need money to do it. Of course with certain types of art you do need capital, but it is thinking of other ways to skin the cat — you have to be quite fly to baulk the status quo. But in another way I do think weirdly, and this is my other notion, that the working class is a massive market for any artist. If you could make a film, like Billy Elliot, that speaks to working class people in an honest way, it was bound to be successful because they recognise themselves and they would be interested. It seems so weird to me that the British Film Industry gatekeepers who are now all middle class have no idea that there is this market that is completely untapped and have no idea how to access it. I think my work is addressing a working class audience and hopefully it’s not too ‘dumbed down’ because I wouldn’t like to patronise anybody. That’s very important to me and in a way it makes me a populist. JGF: I think you can be popular without being a populist — that’s the best formula. JGF: A recent play, The Awkward Squad, looked at the experiences of women during the miners’ strike. During a Radio 4 interview the writer said that today’s chavs are yesterday’s industrial working class. 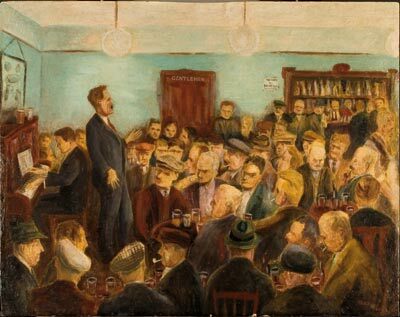 During the 1930s, the scene of the Pitmen Painters, and the 1980s during the miners’ strike, the working class was still a clearly defined category. How do you write the working class today? LH: I saw the most dominate formulation of the working class, as a strong and industrial class, collapse in my lifetime. Where I grew up you could see the distant shipyards from my bedroom and then gradually there were fewer and fewer cranes until they shipped the last remnants off to China. This history seemed very personal rather than an intellectual interest, but I think that I’m drawn, and that a lot of work that I admire greatly, which sees history from the bottom up and is very archetypal of the working class. I was also interested in the contradictions of a lot of the cultural assumptions that those communities made about themselves and the assumptions made about them. First I examined what it is about the construction of the working class and masculinity and why it appears that the working class constructed all of these barriers between themselves and their collective advancement, certainly culturally if not politically. This problem is a very profound political problem — why weren’t they engaged? If we want to get into art we have to get in to politics because of the decline of collective organisations. I was interested in how between the chapel, the church, the co-op, the unions, and the more soft organisations such as the women in the pit villages, there was so much collective effort and organisation that saw a lot of artistic flourishing, like the colliery bands. It seemed the 1984 Miner’s Strikes were pivotal to me and the watershed was when the miners lost that and the support of the TUC. Then it was game over — the loss of around a hundred years of cultural life for a lot of working class people. There are obviously still a lot of working class people about — exploitation is absolutely everywhere so it won’t be lost. As a dramatist I am interested in the fact that it is not a simple case of the goodies and the baddies but the complex negotiations that people have to deal with to express themselves, to look after themselves and their communities. The more tricky it is, the more interesting it is to write about, I suppose. JGF: The colliery band stands out as a great example of working-class achievement. We’re often told that three chords badly played is democracy, whereas in these pit communities people were playing expensive brass instruments, probably bought through collective buying power, and were often very accomplished musicians. This kind of music is not often considered the domain of the working class anymore. LH: The complexity of the music that a band can produce is fantastic and it is based around organisation. I guess I am suspicious of the notion that self-expression is a reified thing because what seems to be just as important but less celebrated in art is the sharing of it and the communal nature of it. This is why I am less interested in the outsider artist and the autodidact who is just weird. For this reason I am much more interested in digging up and worrying about the collective nature of art. I think when someone comes to the theatre you can’t do it by yourself. I do see the theatre in a very rosy way — a little utopian space where people come together and share their creativity in a pretty democratic way most of the time. Certainly, I can’t do my job without the actors, and hopefully vice versa. Coming from a place where we often start from scratch and make it up, I think that it’s an interesting political model to promote. JGF: There’s been a real resurgence in historical dramas, and with them an uncritical rehabilitation of mythical Victorian values and pre-First World War society. During the Thatcher years this Victorian vision of the country house was discredited by Kazuo Ishiguro’s The Remains of the Day. Do you think these dramatisations are part of a revisionist project to efface that history of the ruling class in this country, or do you agree with Julian Fellowes that it’s just Sunday night comfort TV? LH: I don’t think it’s unconscious at all — I think it’s absolutely pernicious. I think it’s a travesty of our history and of our television. I was recently watching Days of Hope which is a series about the interwar years that Ken Loach did in the early 1970s. It basically tells the story, sharing the same territory as Downton Abbey, from the perspective of the people who live on the land. It looks at the complexity of the time and the absolutely disgusting brutality and out-and-out exploitation. It seems that another part of our collective space has been taken away from us culturally. I think it was a disaster to deregulate television because it made everything prone to the worst bits of the market — it is crucial to Downton Abbey to have it in shown in America. There has been an enclosure of public cultural space and you can’t imagine the drama that I do because everybody thinks that what I grew up watching is boring now. A million people would watch it in the ‘70s and it would be the talk on the buses while everyone was going to work. Now, I am told, it is of no interest to the controlling commissioners. Again, I don’t think this is true, but it is a gated space to access that platform. So I think it’s a real tragedy, and it may in some sense be unwitting. It’s seems symptomatic of an age: deregulating the city and deregulating television has opened Pandora’s box, sadly. JGF: In your introduction to Billy Elliot you say that the young people who watched the early cuts of the film didn’t even know what a strike was. Do you think we should be worried about this, or do you think we have to accept that resistance and political activism has invented new forms along the lines of Occupy and direct action groups like UK Uncut. Is it such a terrible thing that trade unionism will not be the form of resistance in the future? LH: What was important about the strike is that people were willing to stand up and fight. Every resource that we have access to today has been made possible by the actions of other people who were fighting for it as long as 50 to 100 years ago. It wasn’t easy — people were ruined by this! If people think these victories can be maintained without some form of effort, it’s not going to happen. So however you get to resistance, it is really important to tell people that they don’t have to accept their circumstances and there is something they can do about it. The trade union movement didn’t just dwindle, it was crushed by the massive resources of the state — its legal and physical resources in what was a 20-year battle. It’s not that it just disappeared and that it was an organic process. It seems to me that if we are going to respond to the problems we have now, as Slavoj Zizek says, the answer has to be collective — ecologically, economically or culturally. We have to learn how to address the lack of community and link up communities to each other — this was what was brilliant about unionism. It was able connect people’s self-interests in relation to their workplace. I think trade unionism, in its Victorian form, could still be a vital tool, but certainly not the only one. It strikes me, even amongst my own kids, that their culture is a very different one from the one I grew up in — they don’t understand the history of resistance and how they can resist. It’s almost a constant battle to educate them about the possibilities and history of resistance. It’s like it’s been wiped out in this one-dimensional virtual world that we live in. JGF: It reminds me that Utah Philips, the American musician, said the most radical thing in America is a long memory. Talking about the idea that it’s not going to be easy to resist the political agendas facing us today, how would you compare the militant communities who faced pit closure with the ones experiencing the Coalition government’s spending cuts today? Do you think we are poorly prepared? LH: I think we are poorly prepared. What happened last time in respect to the pit closures gave rise to huge opposition in the Left, generally. Today the Left is a completely different place to what it was 25 years ago. In that way I think we are very poorly prepared. But I think because of the basic laws of physics that people are going to kick off. I am quite hopeful that it will break people’s inertia and things happen, like in Greece. As always happens during these times the Right is terrifying in Greece. This is only the start and it’s going to get a lot worse for a lot of people, and then they’ll realise it was too late. I have an interest in the culture of the Wobblies and the great heroes, when I was a kid, were Leadbelly, Woody Guthrie and all of that stuff. Back then, even though they were outside of the main culture there was still a big market for it. I was always very interested in how that generation and the ‘60s generation acts as a continuum. The Wobblies used culture and songs and plays as an important part of their politics. I think bad times are generally good for art, but very bad for artists. I’m never worried about art because it is a natural place for resistance. It’s an easy place because when you don’t have a job you have time to think and time to create. The problem here and now is the concentration of resources to the tiny few and the denuding of it for everyone else. But I am optimistic about how we can respond. Lee Hall is a playwright and screenwriter from Newcastle. He most famously wrote Billy Elliot and the stage playThe Pitmen Painters. He is currently working on a film adaption of George Orwell’s Down and Out in Paris and London. Participating and encouraging participation in art seems a very important thing to do, in terms of challenging this bourgeois notion that art is only commercial, concerned with fiscal motives or that you necessarily need money to do it. Published online in August 2012.